Losal Tenkyong was born in the upper Nyang region of Tsang. His mother died early and he was brought up by a nun who was a student of one of the great masters of this time, Tsechokling Yeshé Gyaltsen. Losal Tenkyong was then eventually recognized as the incarnation of Drupwang Losal Tsengyen (1727-1802). 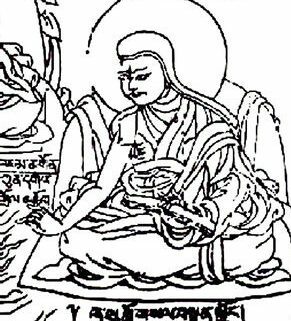 His education was rather eclectic and he studied with the great Gelugpa masters of his day, such as Ngülchu Dharmabhadra (1772-1851) and the masters of his own Shalu monastery (zhwa lu) as well masters of Ngor and Sakya. He became a noted ritual expert and especially excelled in his practice of the Kalachakra. Several of his works are included in such collections as the rgyud sde kun btus and sgrub thabs kun btus. In his personal practice he also emphasized the Shangpa teachings very much. He was of instrumental importance for the survival of the Shangpa Kagyü tradition and authored some important empowerment and instruction manuals which are still in use today. 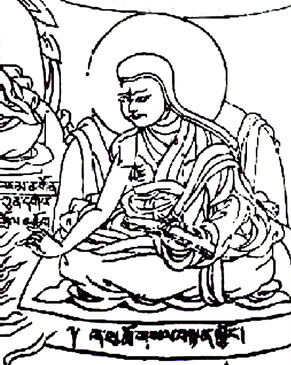 As the abbot of the famous Kadampa monastery of Shalu near Shigatse, rebuilt in the 1330s by scholar and historian Butön Rinchen Drup (1290-1364), he eventually managed to achieve the unsealing of the printing blocks of Taranatha‘s works at Takten Damcho Puntsok Ling Monastery and Ngamring, which contain many Shangpa materials of crucial importance. He was a close friend and associate of both Jamyang Khyentsé Wangpo and Jamgön Kongtrül Lodrö Thayé, and passed on a large number of transmissions to them, especially to Jamyang Khyentsé, who received the full Shangpa Kagyü transmissions from him. Adapted from: Losal Tenkyong’s autobiography rang gi rnam thar du byas pa shel dkar me long, (translation from Tibetan by Lama Shérab Drimé).